Your nervous system is a high complex collection of specialized cells and nerves. The cells, also known as neurons, transmit impulses or electrical signals to different body parts and help you control movements of muscles and limbs. So do you know well about it? Nervous System: What Is It and How Does It Work? The nervous system can be divided into two major parts – the Peripheral Nervous System (PNS) and the Central Nervous System (CNS). The PNS consists of a complex network of nerves that form a bridge between your CNS and the rest of the body.Your central nervous system functions as the basic or primary control center for your body and is made up of your spinal cord and the brain. Both of these systems work together to collect and process information gathered internally or externally.Or you can say the nervous system collects info and dispatch instructions based on the info to the rest of your body. The brain is the ultimate destination for storing information – it means the information collected through your nervous system reaches your brain where your brain cells sort everything out and send out commands. Your brain has different sections as well, including the cerebrum and brain stem. These parts perform different roles, from gathering and storing to sorting and retrieving information. Usually, it performs smoothly when it receives information through the spinal cord. 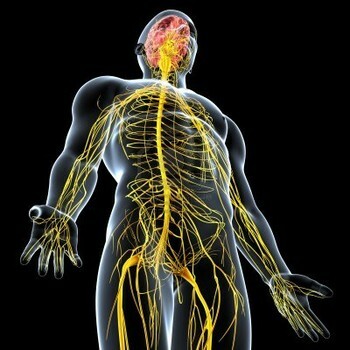 It is worth mentioning that the nerves reaching to your peripheral system branch from the spinal cord or the brain stem, and each of these nerves connects to a particular area of your limbs or torso and maintains proper communication. You can divide your PNS into smaller pieces, including the somatic and autonomic systems. The somatic consists of parts of your body that you can control at will, whereas the autonomic section handles involuntary functions, like pumping blood. Through these processes, it is important to point out all information moves in the form of cells called neurons. Quite interestingly, these neurons can only transmit information in one way, and those transmitting from the brain are called motor neurons while those transmitting signals to the brain are sensory neurons. The CNS has two basic parts – the spinal cord and the brain of course as we have talked above. Here's more about it. With an approximate weight of 1.4kg, your brain receives information and processes it through brain cells, nervous, etc. It has several nerve cells known as neurons and supporting cells known as the glia. Your brain also has White Matter and Grey Matter – the grey matter receives and stores electrical signals, whereas white matter takes electrical signals to and from grey matter. Your brain has four principal parts as well as two other parts. The Medulla oblongata, or commonly called the brain stem, is located between your spinal cord and the pons. The majority of your brain is called the Cerebrum, which is further divided into two hemispheres, right and left, with each supporting activities of their respective sides of the body. The Cerebellum is right behind and slightly below your cerebrum. The fore brain stem or the Diencephalon includes the Hypothalamus and Thalamus. The Pons serves as a pathway to different higher structures and manages conduction between your higher brain centers and the medulla. The weight of your spinal cord is usually between 35 and 40g. The spinal cord is like a tube that extends directly from your brain, and is about 45cm long in men and 43cm long in women. It has 31 segments with a couple of spinal nerves extending from each segment – the region from which these nerves extend out is known as the spinal segment. Your sensory and motor nerves are both in the spinal cord. The combination of three membranes that cover your spinal cord and the brain is known as the meninges. The Dura Mater is the outermost layer, whereas the Arachnoid is the middle layer. The innermost layer is called the Pia Mater. The basic role of these layers is to protect your brain and spinal cord from bacteria and microorganisms. It's the fluid circulating around your spinal cord and the brain, and its main role is to protect your brain and spinal cord. There are two basic parts of your peripheral nervous system – somatic nervous system and autonomic nervous system. Get to know more about them with the table below. Also called the Voluntary Nervous System, it manages voluntary movements through your skeletal muscles. It contains efferent nerves that help your muscles contract. The whole system consists of cranial nerves, spinal nerves and association nerves. Also known as the Visceral Nervous System, it manages involuntary movements in your body. It gives rise to several control systems of your body and usually works unconsciously. It plays an important role when choosing between fight and flight mechanisms, helps calm your body by managing blood circulation, etc.